Hopelessly Devoted Bibliophile: Interviewing Aphrodite! 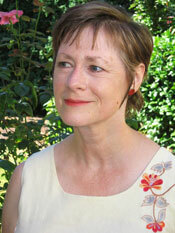 Please welcome Suzanne Williams! She's here today to promote the newest book in the Goddess Girls series, Aphrodite the Diva. These books are sugary MG goodness and I adore them! Here you'll get to see a little bit into Aphrodite's life as a goddess girl. 1) Welcome Aphrodite! What do you say to those that call you a diva? Who? Me? That’s ridiculous! Sure, I can be teensy bit dramatic at times, but only in situations that call for it. I mean, mortals want their goddesses to look and act like goddesses, right? Taking special care with my makeup and hair and dress is important! And if I add a few more flourishes than are strictly needed while performing feats of magic, that’s only because mortals like a good show. Being the goddessgirl of love and beauty isn’t easy, you know? And despite what that hoity-toity Egyptian goddessgirl Isis says, I’m the real deal! 2) Do you have a favorite fashion accessory that we must all know about? My best friends, Athena, Artemis, Persephone and I, all wear look-alike gold necklaces with double-G charms (for Goddess Girls) everywhere we go. The necklace is stylish, it goes with all my chitons, and it shows that my friends and I share a special bond. 3) If you had to describe friendship in just one 10 word sentence, what would you say? 4) Is there anything that you are really looking forward to that is coming up? 5) Last question, what is your favorite part about being a Goddess? Being adored by mortals is divine, and most boys find me irresistible, but my favorite part of being a goddess is helping others find love. And though I’ve made a few mistakes (like that unfortunate Trojan War incident), I’ve had lots of successes too! In book 6, an exchange student from Egypt, Isis, is encroaching on Aphrodite's match-making turf. Will she also edge Aphrodite out of her group of friends? These classic myths from the Greek pantheon are given a modern twist that contemporary tweens can relate to, from dealing with bullies like Medusa to a first crush on an unlikely boy. 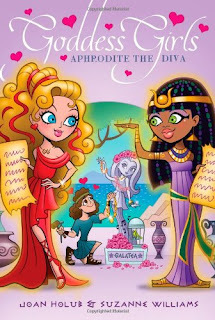 Goddess Girls follows four goddesses-in-training: Athena, Persephone, Aphrodite, and Artemis and their friends as they navigate the ins and outs of divine social life at Mount Olympus Academy, where the most privileged gods and goddesses of the Greek pantheon hone their mythical skills.